Alo Apparel Size Chart Wherever you go, it goes! Lightweight, ripstop fabrication makes this perfect for travel. Attached hood with drawstrings. Long sleeves with elastic cuffs. Full front zipper closure. 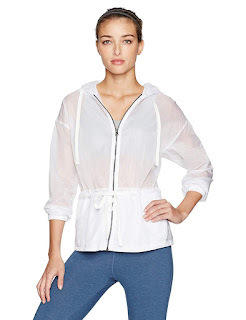 Drawstring defines waistline and creates a flattering fit. Straight hemline. 100% nylon. Machine wash, tumble dry. Imported. Measurements: Length: 26 in Product measurements were taken using size SM. Please note that measurements may vary by size.